She also criticized Comey for leaking FBI work documents knowing they would go to the press. 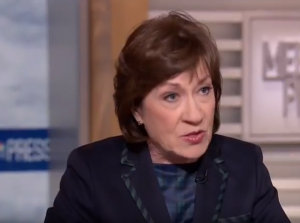 "Second would be don't write a book in the middle of an investigation," Collins said. Todd asked her whether she thought the book could be disruptive to the Robert Mueller Russia probe. "That's what worries me," Collins said. "I cannot imagine why an FBI director would seek to essentially cash in on a book when the investigation's very much alive. He should have waited to do his memoir."